The AdWords API JS library is listed on the AdWords API client libraries page, and is hosted at http://code.google.com/p/google-api-adwords-js. The library distribution is available for download from the downloads page: http://code.google.com/p/google-api-adwords-js/downloads/list. Full support for AdWords API versions v201008 and v201101. Code examples for all the common AdWords tasks, similar to other client libraries. Tested to work in Internet Explorer, Firefox, and Chrome. See the project wiki for details. Includes minified JS scripts, compiled and optimized using the Closure compiler. JSDoc documentation for the entire library. We believe that Chrome and Firefox browser extension developers will benefit most from this client library. 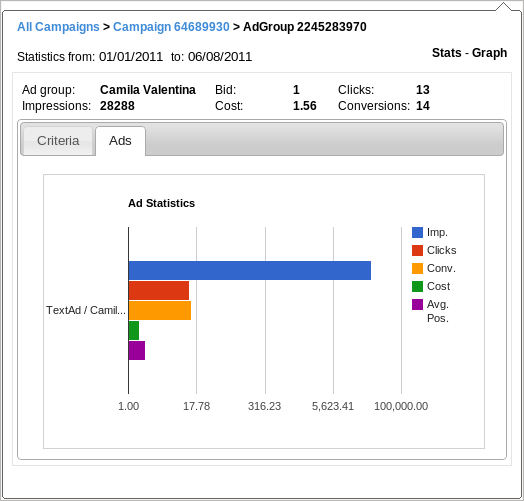 Keeping this in mind, we developed a Chrome extension that allows an AdWords user to browse his Campaigns, Ad Groups, Ads and Keyword statistics. The extension is being made available as a code example at this address. You can refer to the wiki article at http://code.google.com/p/google-api-adwords-js/wiki/ObjectStatsExtensionReadme for details on its installation and use. Please join us on the AdWords API forum to discuss the new client library and the Chrome extension and report any bugs on the project’s issue tracker or forum. 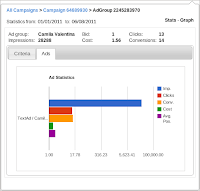 - Anash P. Oommen & David Torres, AdWords API Team.